'This innovative volume engages with core theoretical and empirical issues concerned with education and diversity in a region of rapidly increasing global significance.' - Leslie Bash, Social Science, UCL Institute of Education, UK. 'This is a timely volume as we wrestle with global educational issues. The focus is on Asia in multicultural discourse is long overdue. This handbook through a series of chapters written by colleagues in the field of multicultural education, provides rich and incisive perspectives on multicultural education that will assist colleagues and students transforming theory into practice. Readers will find the volume a repository of varying perspectives that will challenge and encourage deep dialogue on these issues. This book is a valuable contribution to an important field of study.' - Ann E. Lopez, Associate Professor, University of Toronto, Canada. President-Elect, National Association for Multicultural Education. ‘Through its incisive conceptual framing and breadth of research contributions by leading and emerging multicultural education scholars, this first of its kind handbook is vital for understanding the complexities and intersecting challenges of realizing cultural diversity, social justice, and human rights in life and learning in schools and societies in Asia Pacific.’ - Jabari Mahiri, Professor of Education and Brinton Family Chair in Urban Teaching at the University of California, Berkeley. 'This volume is a product of carefully orchestrated international collaboration. 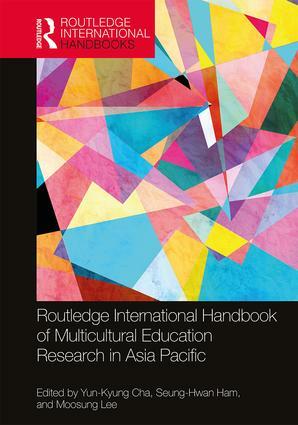 It provides sufficient breadth and depth of information about multicultural education in the Asia Pacific region. I commend this book to anyone interested in equity and diversity in education.' - Kyung Hwan Mo, Ph.D. Professor of Education, Seoul National University, South Korea. President of the Korean Association for Multicultural Education. Yun-Kyung Cha is a Professor at the College of Education, Hanyang University, South Korea, the former President of the Korean Association for Multicultural Education (KAME), and the Editor-in-Chief of Multicultural Education Review. Seung-Hwan Ham is an Assistant Professor at the College of Education, Hanyang University, South Korea. Moosung Lee is a Centenary Professor at the University of Canberra, Australia, and the Co-Editor of Multicultural Education Review.